Once, long time ago, when digital was still science fiction, I already had a filter system from Cokin. As far as I know it was the first of its kind and I used it for a couple of year before it got lost into oblivion. It took more than twenty years before I made the decision for a filter system again. This time I did not wanted Cokin because of its ugly color cast. I wanted the best of the best and chose Lee filters. I used the Lee filters for almost ten years and I loved it. I owned a Big Stopper, the Little Stopper, a set of soft neutral density gradient filters made of resin and the Lee Landscape Polarizer. During the time I used Lee filters, a lot of other manufacturers introduced their share of filter systems and many of them offered better quality than the Lee filters I used. But if you know the shortcomings of your system, you can anticipate and make a work around. Especially the Big Stopper suffers from a serious color cast, something that is almost absent in the new generation neutral density filters of many other brands. The famous Lee Big Stopper. A wonderful glass filter that makes it possible to make exposures that are 1000 times longer. Today every filter manufacturer has an own version of this filter. When I was contacted by Haida filters, and received a set of filters for a review, I found out in real live how much better the filters had become since the time I started with Lee. The Haida 10 stop neutral density filter was really neutral, and no serious color cast was visible. But the Haida system had some other downsides, like a lot of reflections, and a polarizer that became unreachable when the filter holder was placed. So I kept on using the Lee filters and its gargantuan Landscape Polarizer. 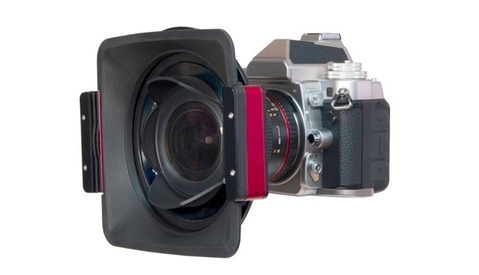 The Lee Landscape Polarizer is a 105mm big filter that goes in front of the filter holder. 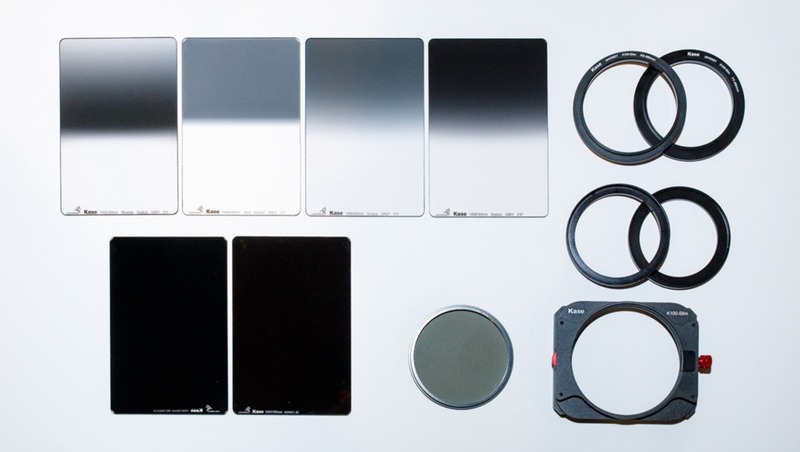 The polarization filter cannot be used without the filter holder. Placing the filter on the filterring was tricky and I had to be careful, always. In 2018 I decided to exchange the Lee Foundation filter holder for the LucrOit filter holder, which had a much safer connection to the lens. The Lee filter holder was prone to fall off, something I experienced once and damaged the corner of a gradient filter. LucrOit also offered a ring for the Landscape polarizer, which made it possible to keep on using all the filters I owned. 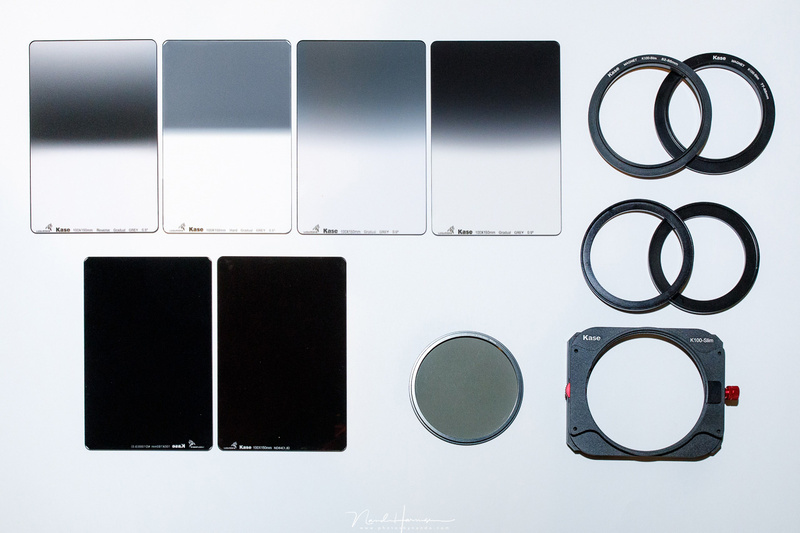 It made it possible to gradually replace all Lee filters, which showed signs or wear after all those years of use. At last the inevitable happened: a gradient filter got scratched and I needed to replace it. After all those years it finally was time to take a look around for another filter. Although I loved using the Lee filters, I wanted something else, something that was very good, very robust, and of made of glass instead of resin. I looked at filters from LucrOit, NiSi, Benro, and a bunch of other brands, but I ended up with the Kase Wolverine 3 stops medium gradient ND filter. I changed the Lee filterholder for the LucrOit filter holder. This holder stays in place much better. This was the first use of the Kase Wolverine medium 0,9GND filter. I spend a lot of time with this wonderful filter, and became convinced I wanted to replace all my Lee filters one by one. 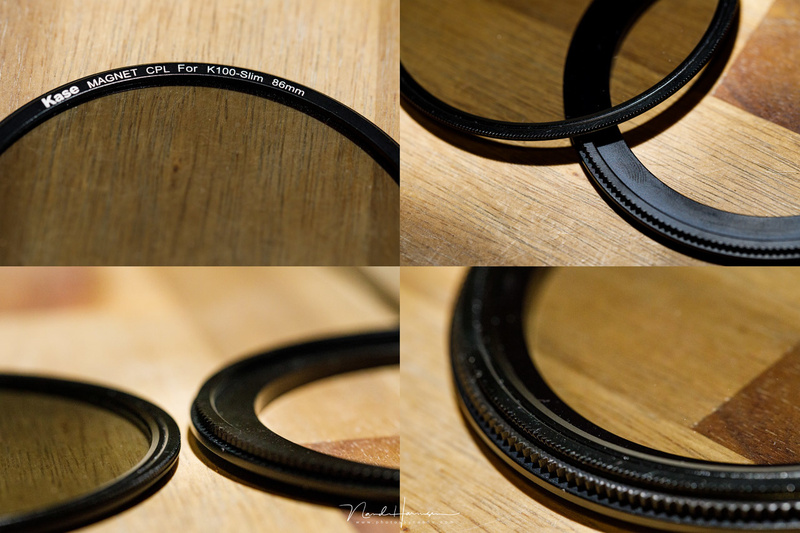 When I looked at the Kase polarizer filter I was in for a surprise: it was a magnetically locked in the adapter ring. And after I informed with a couple of friends that already used Kase, I decided to exchange not only my filters, but also the LucrOit filter holder for the Kase K100-slimline system. 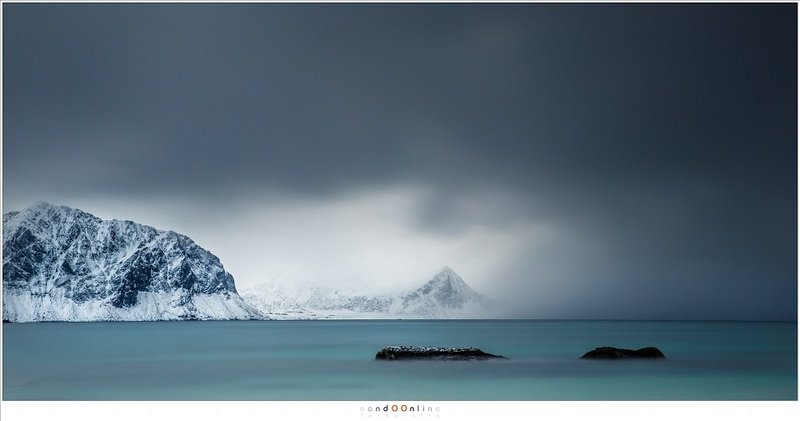 During my Winter at Lofoten photo tour I had a perfect chance I test the Kase system under challenging conditions. Why this long introduction? I want to make clear there was a good reason for changing the filter system. I was happy with the Lee filters, and I am convinced I could go on photographing with it for many years to come, if it wasn’t for the traces of use. I did not change the filters because they were bad, but because it was necessary. Nevertheless, now I have the Kase filters it has become clear that the Lee filters were a kind of vintage. The Wolverine glass of Kase is far superior to the resin material used by Lee and the filters produce a much sharper image. Installing the Kase filter system. First the rotating adapter ring, next the magnetic polarization filter and the K100-Slimline filter holder. Finally a GND filter is installed. The filter holder is compact and from light weight material. It is fitted standard with two slots for 2mm thick filters. It possible to change it for three filter slots. 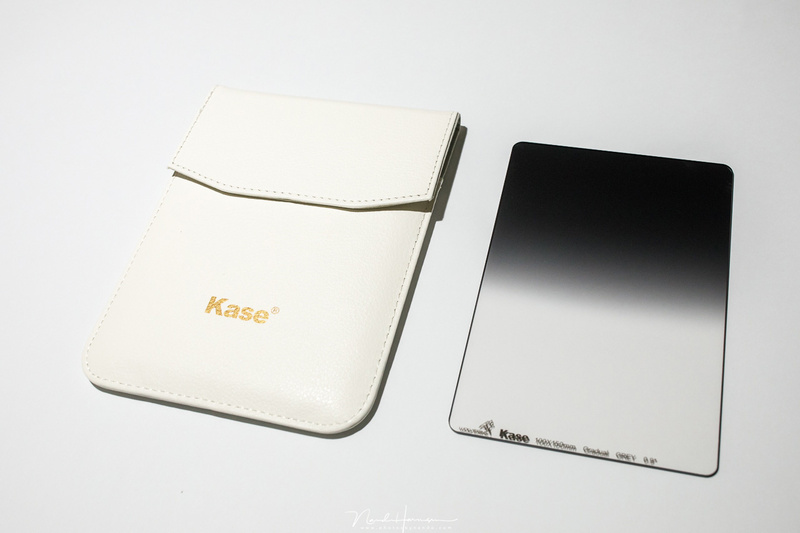 Because Kase also has filters with 1.1 mm thickness, a set of 1.1 mm slots are included. However, it is not possible to combine the 2mm and 1.1 mm thick filters. 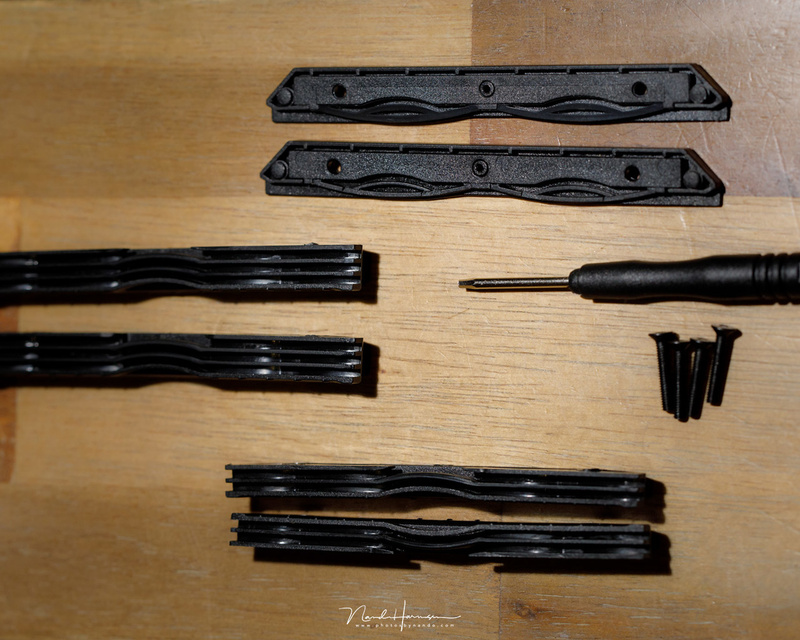 A set of filter slots that can be installed on the K100-slimline holder. You can chose between two or three slots, for 2mm or 1.1mm thick filters. The filter holder is held in place by two tabs on one side, and with a screw on the other side. The tabs are quite small, to you have to make sure the holder is placed correctly. The holder cannot be rotated when tightened. You have to loosen the screw just a little a bit – something like 1/8 of a turn. Unless you loosen the screw too much, the holder stays in place perfectly. The K100-Slimline holder is well build. The connection with the adapter rind is firm, without the risk of losing it. Everyone who used really dark ND filters like a 6 or 10 stops ND, knows about the foam on the filter to prevent light leaks. 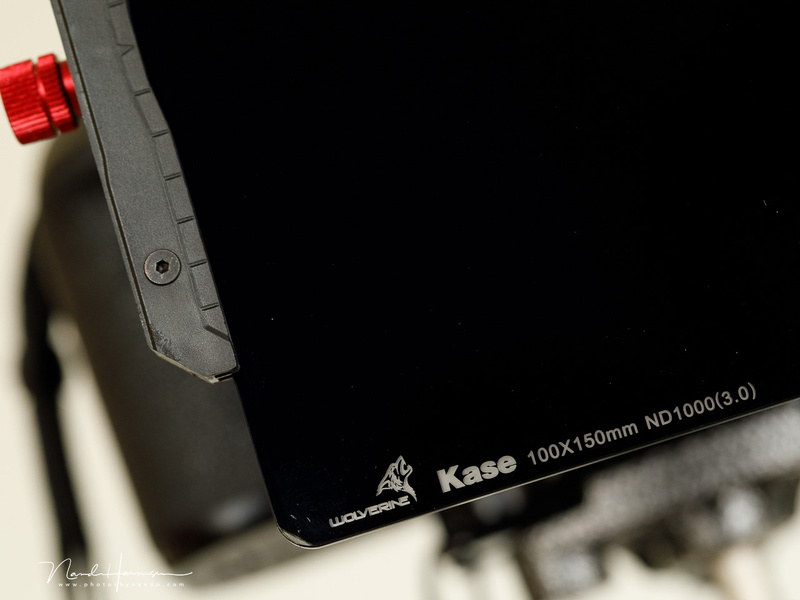 Kase has placed the foam on the filter holder itself, instead of the ND filter. So there is no foam on any of the Kase filters. If you want to use ND filters of other brands, you will have to remove the foam, or use the filter backwards. I find the only problem the amount of pressure I have to use to place or remove a ND filter in the first slot. I think it is because of the foam. The K100-Slimline holder has a foam layer, which makes any foam on the filters itself not necessary. The foam layer is visible through the GND filter. The K100-Slimline holder kit is available in a package, together with a polarizer, 82mm and 77mm adapter ring, and two step up rings from 67mm and 72mm. This way you get everything you need to start with filters in one package. 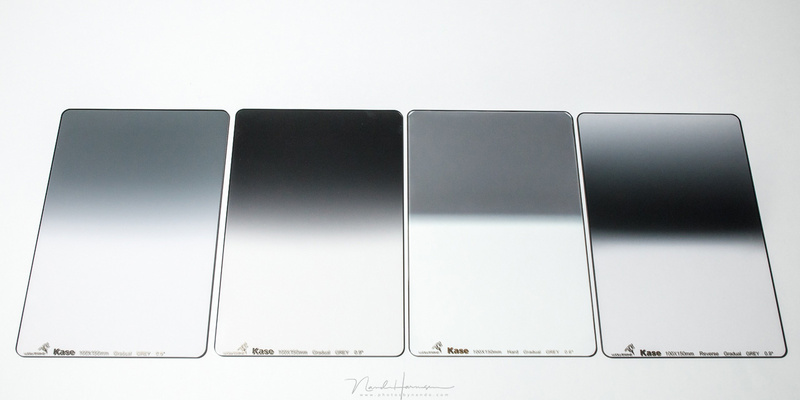 The filters of Kase are made of a very high quality glass called Wolverine. The most remarkable thing about these filters is their hardness and scratch resistance. It is said these filters can take a fall on rocks without problems. I did not try this of course but it gives a good feeling when standing on a rocky beach while working with filters, knowing it won’t break that easily if you let one fall. A few demo films can be found on the website of Kase, demonstrating the strength of these filters. 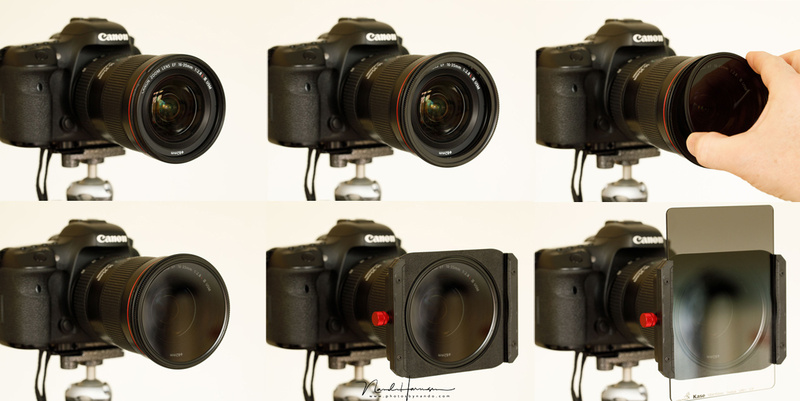 For the replacement of my Lee filter set I chose the Kase Wolverine ND64, ND1000 and a set of different GND filters. And the polarization filter of course, that comes standard with the K100-slimline filter holder kit. All filters come in a nice pouch lined with felt. Unfortunately the pouch does not indicate which filter it contains. But every filter has a line of text which mentions the type of filter. 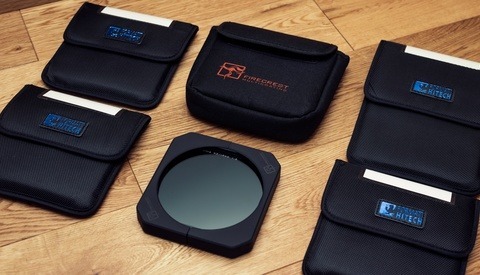 Each gradient neutral density filter has its own pouch. The type of filter is printed on the bottom of the filter. These filters are available in the standard 100x100mm size, but also in 100x150mm. I chose the bigger filters because it is easier to place or remove it from the holder. The foam lining on the K100-slimline holder makes any foam on the filter itself unnecessary. The filters are very well build. They have a rounded corner, thus eliminating the sharp edges that are the most vulnerable. The Kase ND1000 ND filter. This filter has no color cast whatsoever. It comes in 100x100mm or in 100x150mm. One of the demands I had for a new filter system was the absence of any color cast, especially with the 10 stops ND filter. There are only a few brands that come close to a perfect neutral density. Most filters still show a slight color cast. From all the tests I read the Kase ND1000 came out the best, with absolutely no color cast whatsoever. I don’t have any way of testing this, except in a non scientific comparison from my trip at Lofoten. A simple comparison. The left side is without filter and the right side with the Kase ND1000 filter. 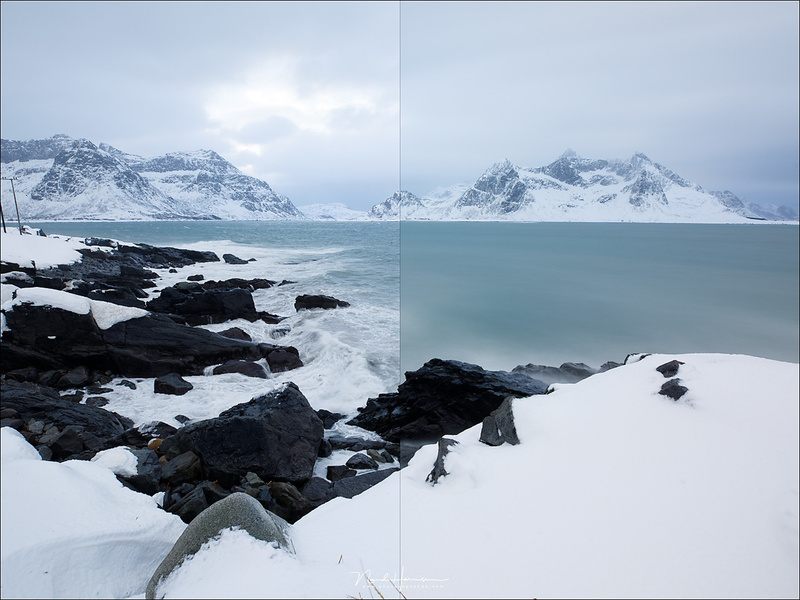 Both images are shot with 5000K white balance and no post-processing. Just like the ND filters, these 100x150mm gradual neutral density filters are made from the Wolverine glass that can take a fall on rocks. The corners are rounded also, making it a great premium looking set of filters. I have chosen the hard 0.6GND, the medium 0.6GND and the soft 0.9GND for my set. And I recently added a reverse 0.6GND. The notification is also written on the bottom of the glass. The absence of any color cast is also important for these filters, especially when you tend to use these filters stacked. Although I found the Lee resin filters very good, these filters still produce a noticeable color cast. I was surprised to see no color cast at all when I used the Wolverine filters for the first time. I made a simple comparison on a famous beach at Lofoten, with and without the medium 0.9GND filter. These images have been processed in Lightroom, but both with the exact same settings. 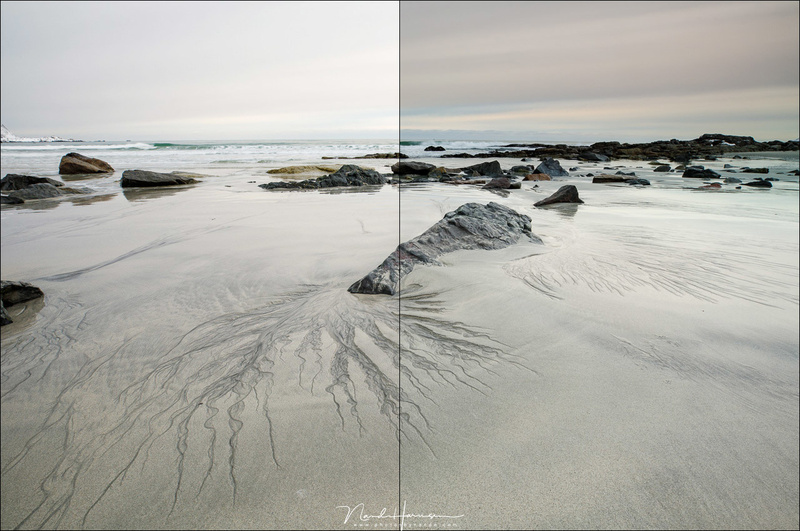 Both images have the same white balance of 5000K, set in the camera itself. This comparison is not scientific at all, but it shows no visible difference in color for the naked eye. Although I always liked the Lee Landscape Polarization filter, I noticed a growing dislike for the huge size. The filter is placed in front of the filter holder and makes the use of a filter holder mandatory. That is why I once decided to change the Lee Foundation holder for the LucrOit, which has a significant lower risk of falling off. 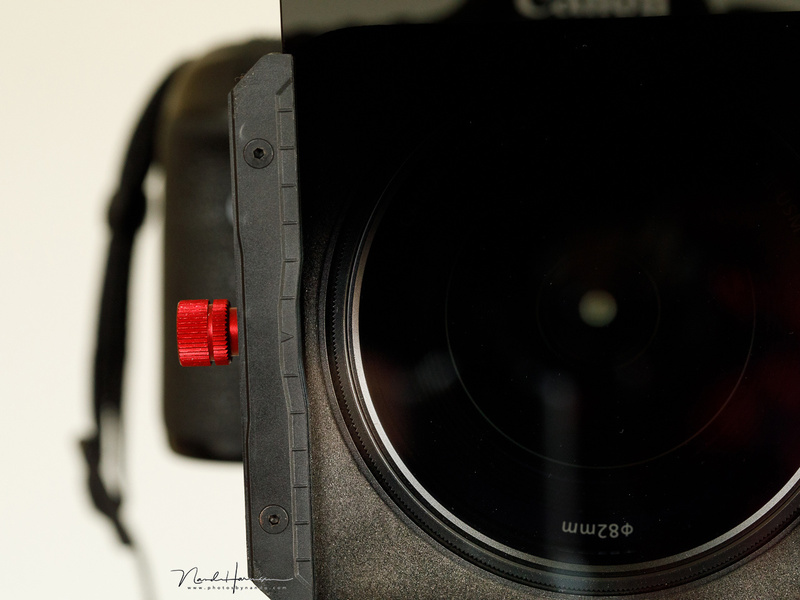 Fortunately the polarization filter of Kase is placed directly on the adapter ring. This makes the filter much smaller and you don’t have to install the filter holder if you only want to use the polarizer. 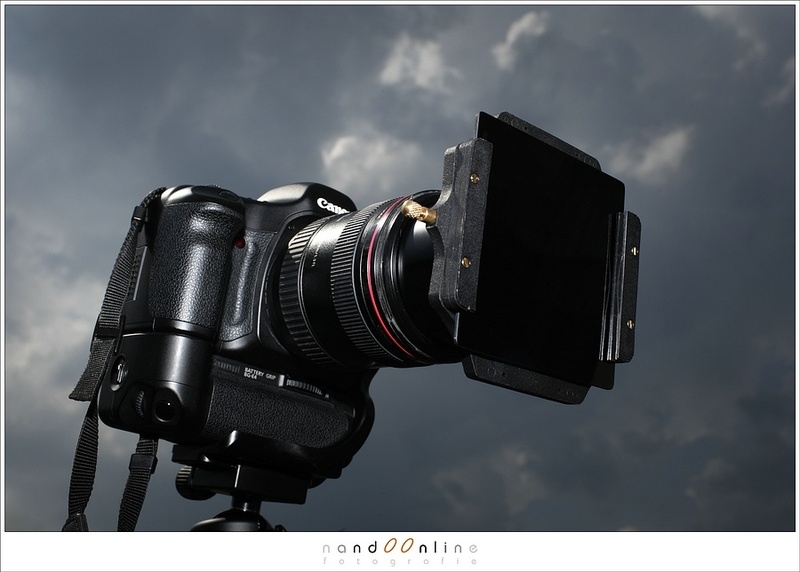 The magnetic polarization filter is easy installed. The rotation is build into the adapter ring, and not in the filter itself. The best thing about the Kase Polarizer is the magnetic mount. The filter is held in place in the adapter ring by a powerful magnet. 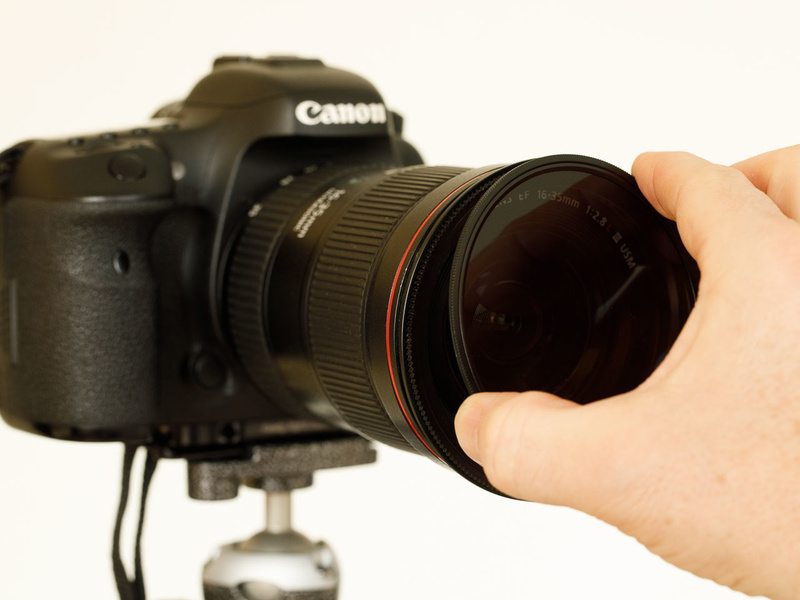 The polarizer itself cannot rotate, but the rotation is built into the adapter rings. It makes the construction of the polarization filter much simpler, and placing the filter is easy and quick thanks to the magnet. It makes the use of the filter very friendly. 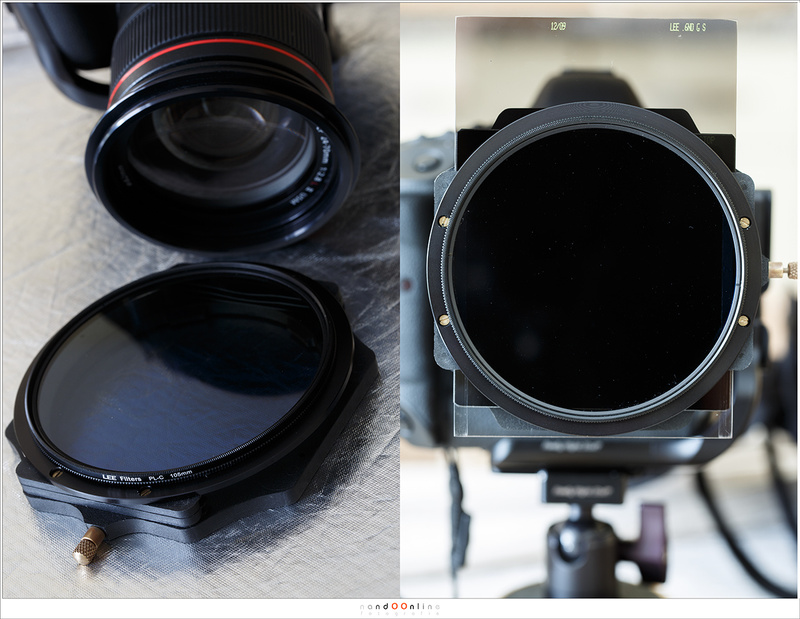 An impression of the 86mm Kase polarization filter, together with the rotating adapter ring. When the filter holder is in place, with filters installed, you still can rotate the adapter ring which contains the magnetic polarization filter. This is done by a wheel on the side of the filter holder. It rotates very smooth and easy. 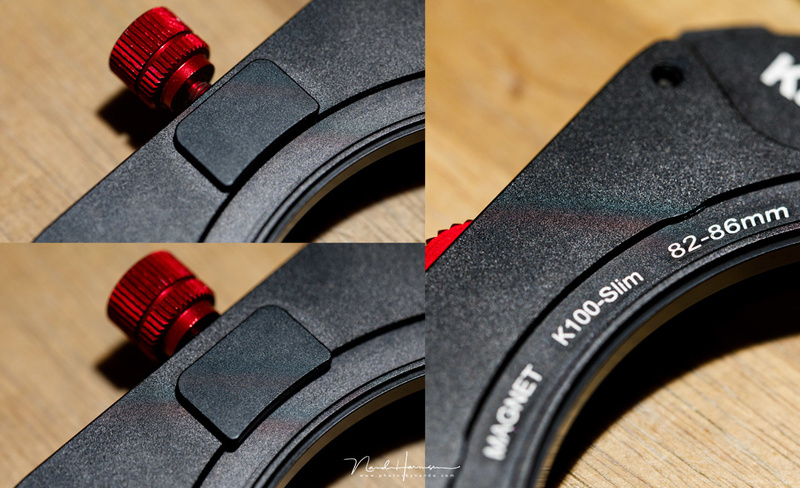 The Kase K100-Slimline filter holder has a red wheel that makes it possible to rotate the polarization filter when ND or GND fitlers are installed. The rotation is smooth and easy. I always loved my Lee filters. And a few years back I had a change to try out Haida filters with not much satisfaction. But now I have Kase and I love the filters and the filter system. I am very impressed with the absence of any color cast and the magnetic polarization filter. 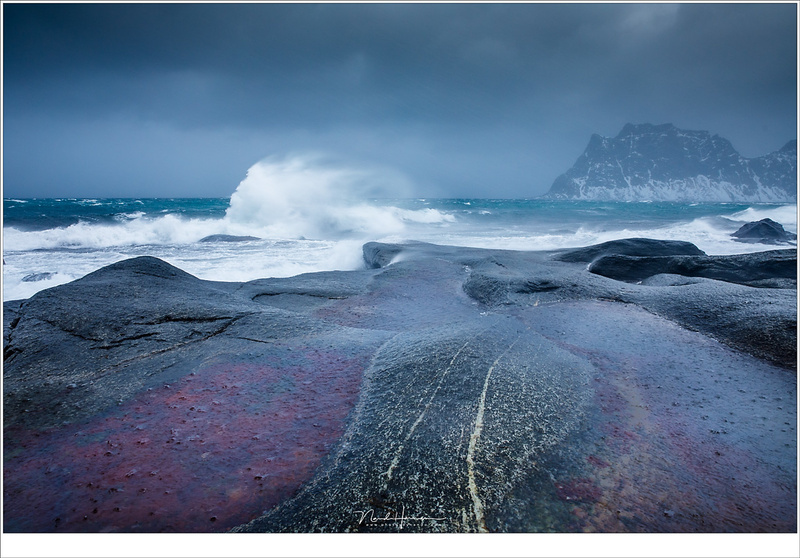 During the week at Lofoten I used it constantly under the worst weather situations I have ever experienced. The filters are very easy to use, and the quality is perfect. 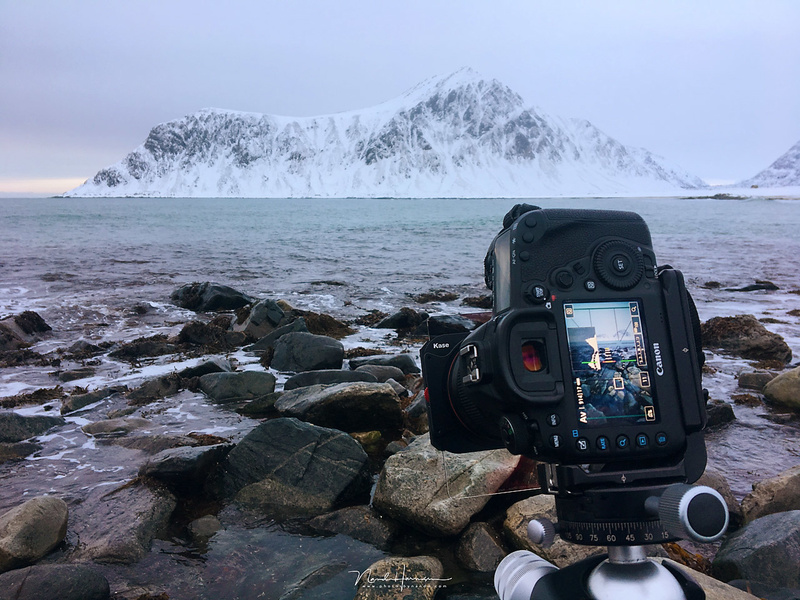 The participants of my Winter at Lofoten tour were also impressed and one of them has already decided to exchange his filters for the Kase system. The complete Kase filterset I have at this moment. A great set of filters for the years to come. I can recommend Kase for every enthusiast landscape photographer. There are only a few things I would like to change. The fitting of a filter in the first slot is very tight. This should be made easier. The tabs on the K100-slimline holder are very small. Making these a little bit larger wil improve installing the holder. But I cannot think of another improvement. There is a little voice in the back of my mind that keep reminding me these filters are very tough, surviving a fall on rocks. It feel reassuring, but I hope I will never have to find out. Bottom line, I can really recommend these wonderful Kase filters. They’re well worth it. Photographing at a famous beach at Lofoten. Working with the Kase filter system was lots of fun, easy and the results were perfect. Thank you for a well written review. Never heard of the brand, but the high price of the Lee filters is why i never got them. 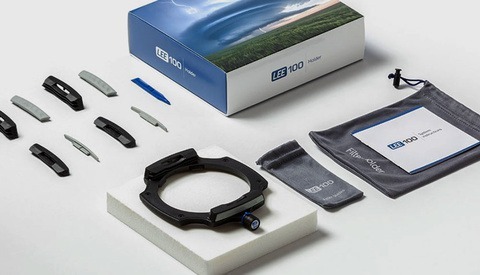 Each of the grad filters are a little pricey at $150-180, but still reasonable compared to Lee. Need to look more into this company's filters. Quality glass is expensive indeed. Great review. I also moved to Kase, coming from lee and I never looked back. Have those filters for more than one year now. The magnetic polarizer is just great and I also love the coating of the Wolverines. When shooting at the coast it's just so easy now to get off the spray and salt water. Indeed. Much easier cleaning compared to resin. I read about the filters and decided to buy one filter. I was blown away by the quality and no one told me to do so. Next I bought the filters and filter holder. Quite some investment, but well worth it. After the review Kase contacted me for a cooperation, and I am looking into it. Lee is starting to fight back with a new filterholder, so I read today. But no new filters as far as I am aware of. Even if they did, I never want to go back to resin, like the Lee gradient filters. The sharpness of these Kase is so much better, compared to Lee resin. @Roar: If you like your lee's and the workflow with them, then there's no need to switch in my opinion. But especially with the front polarizer the lee system was very cumbersome to use for me. That was the main reason for me to switch and that I wanted to try glass filters for a change. I have a full video about my first impressions and why I switched. Mind in the video I still use the K6 system. The new K8 with magnetic polarizer is much better to use. I have since updated to this one ( If you look through my channel you find another video) . Also I did a color cast comparison to Lee filters in that video and found both to be very good -> no noticeable cast. Thanks, Michael. Your videos did help me making the choice. It convinced me to choose for Kase, together with some other good reviews about it. Thanks for this interresting reading! The kase filter system and polarising filter looks very cheap... Do you have compared optical performance (sharpness, reflections?) of Lee and Kase polarising filter? And can you user Lee ND grad into Kase holder? Thanks! I'm using Kase since I've made the switch from Lee almost 2 ago and I was pretty surprised by the low color cast if you compare it to the Lee 10 BigStopper. Optical performance of the square filters and the CPL is superb! The magnetic CPL is genius. As long as you are using the "normal" 2mm filters you can use Lee filters in combination with the Kase holder. Only if you go for their so-called SlimFilters (1.1mm instead of 2mm) you can't use Lee or other brands. Just as Matthias mentioned, the CPL and holder is absolutely not cheap, except in price - especially compared to the enormous Lee 105mm polarizer. I have added a shot straight into sunlight, with a Kase CPL and KAse soft 0,6GND. 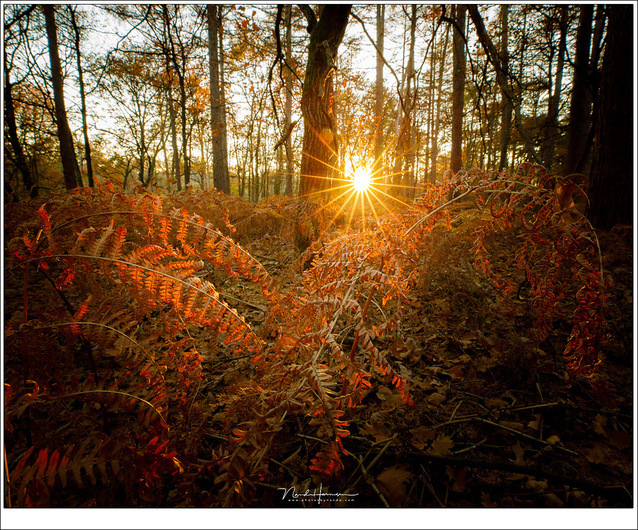 I did not remove any flare in post, so this is what you will get in these conditions (Shot with Canon EF16-35mm f/2,8L III @ 16mm and f/11. more paid sponsored ads looking like reviews. suprised that after a painstakingly long search for an alternative he did not decide to stick with lee filters. A new filter holder is not the answer. Lee is still sticking with resin GND filters, and the Big Stopper is become vintage. New techniques made real neutral density filters possible and Lee did not do anything to improve their filters. Perhaps soon, but I needed new filters at this moment, as you may have read in my review. You may believe me or not - Kase did not pay anything, nothing is sponsored... well, the only one that got sponsored is Kase, when I spend over 800 euros buying these filters. There are a few special adapter rings for the K150 system. Tamron 15-30 for example doesnt have a filter thread. Indeed, some extreme wide angle lenses don't have filter threads. Just like my Canon TS-E 17mm, Canon EF11-24mm and the Laowa 12mm. For some lenses there are adapters that fit the lens barrel and don't need a thread. But this is often made only for a few, most popular, most expensive lenses.